Our latest show in Inworldz is now on the web! Join us as we journey to a different grid – Inworldz – to explore a very special new event in progress there – Relay for Life of Inworldz, which will reach its climax with a Relay Weekend on the 3rd and 4th November. 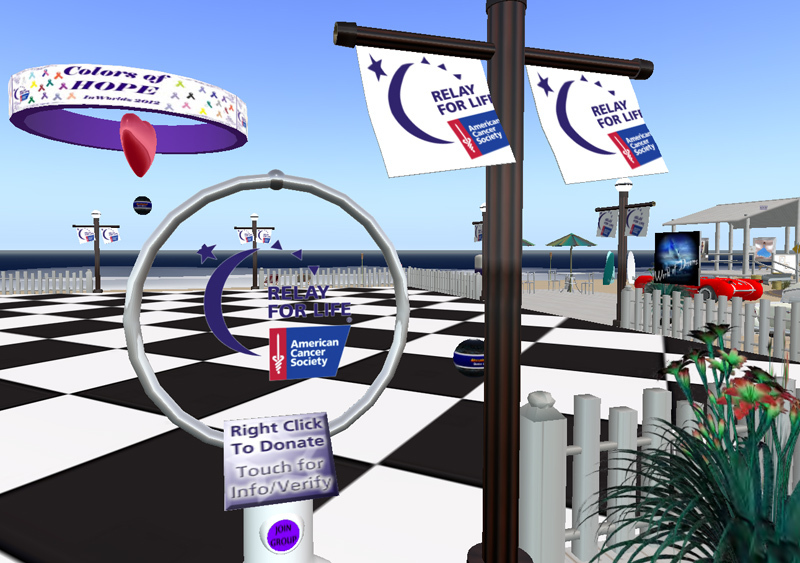 Although Relay for Life of Second Life is a huge event and raises millions of Lindens for the American Cancer Society every year, this is the first time that a full Relay program has been run in the much smaller Inworldz grid, with the backing of the ACS, and it’s fascinating to see how things are developing there – in some ways very similarly to the early Relay for Life in Second Life events. We yalk to some of those involved, and some familiar names from Second Life (and from Relay for Life in Second Life), including Bain Finch, Nber Medici, and the well-known DJ Ayron Dagger, who spoke so movingly about a renewed fight against cancer during the Telethon this July. And wealso chat with Elenia Llewellyn, both about this event, and about how things are progressing in Inworldz. Next Post: More Fun Noir! Hear the special bonus radio play from The Blackened Mirror on the web!